Title:TRAILS END CAMPGROUND, LLC v. BRIMSTONE RECREATION, LLC, ET AL. Title:VIRGINIA LOUISE BURKE, ET AL. v. HUNTSVILLE NH OPERATIONS LLC, ET AL. 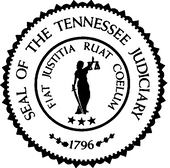 Title:STATE OF TENNESSEE v. TEDDY RUSSELL ROBBINS, JR. Title:SCOTT OSTENDORF, ET AL. v. R. STEPHEN FOX, ET AL.